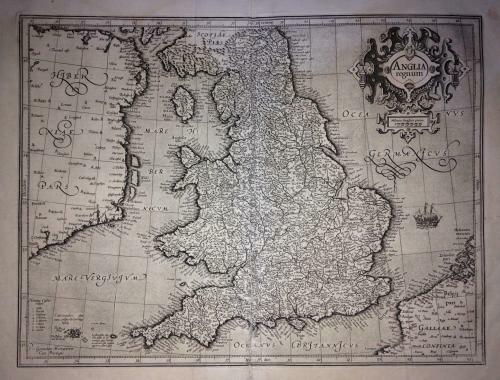 Title: 'Anglia Regnum', Duisburg 1595: a map of England from the Mercator's Atlas III.' Edited by Jodocus HONDIUS, in "Gerardi Mercatoris- Atlas sive Cosmographicae de Fabrica Mundi et Fabricati Figura". Latin Edition, 1623. Mercator is considered the founder of mathematical geography. Mercator was the first to affix the word "Atlas" at the head of a mapping work. With a highly decorative strapwork title cartouche. A strong impression with wide margins. A small spot in the top margin (visible in the photograph). Very good condition.